I actually watched the entire "Bad Romance" video this morning before work, so the song was stuck in my head all friggin' day! Did I say "was"? I meant "still is"! "3" got in there for a short while, but that didn't last very long. Did you know that the new Kidz Bop album (#17 in the collection of songs sung by kids for kids) features "Paparazzi"? That can't exactly be good, can it? Yes, teach your children that they can be stalkers too with a song that features the line "I'll follow you until you love me." And later I got snippy at the radio during my commute home when the DJ pronounced Alannah Myles' name wrong. Plus it looks like my copy of the first issue of the Mass Effect book probably won't get here until next week. Tfaw.com just notified me that they "Intend" to send me a copy, but I'm still disappointed. Oh, and have you ever changed your computer's wallpaper one night, and then when it comes up the next day it takes you by surprise? 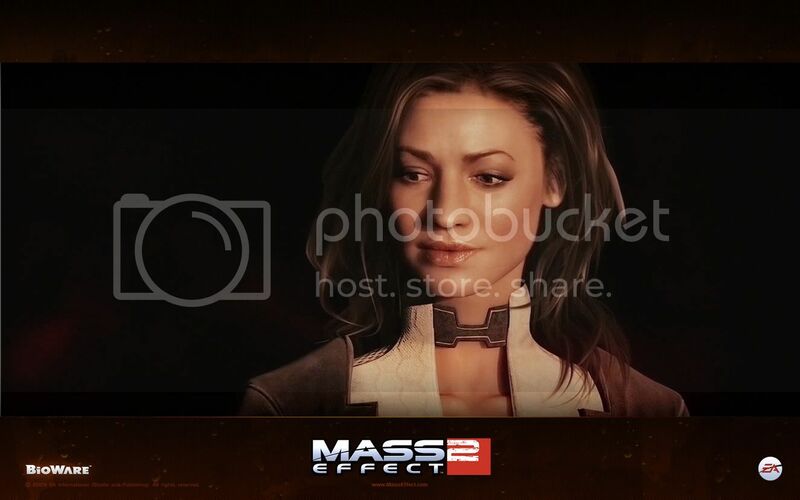 I downloaded a wallpaper of Miranda Lawson from Mass Effect last night (yep, that's a computer-generated version of Yvonne Strahovski), and when it came up tonight it took me by surprise. "Where did this come fr-- Oh, yeah, now I remember." I know for sure that Liara's face was model off an actress', but I can't remember her name (it wasn't the gal who did her voice), and you have Joker looking just like Seth Green, plus Matriarch Benezia was modeled (in part) off of Marina Sirtis, and Illusive Man sure looks a lot like a younger Martin Sheen, so you've got a lot of real-world breaching going on in Mass Effect. Miranda's look, from what I understand, was originally suppose to be someone else, but they decided to go with Yvonne, and just make her a brunette. It's all part of making the game more cinematic, allowing the player to create their own movie. IMO Joker looks nothing like Seth Green and Illusive Man doesn't look like Martin Sheen at all, IMHO. Miranda's look is just very in-your-face and from videos I've seen, when she doesn't have an expression it looks like they just cut-and-pasted a picture of Yvonne's face onto the character. Could the actress for Liara be Romola Garai? That's who she looks like to me. Well, the ME-wiki says it's Jillian Murray, but Romola Garai looks close. I've seen some of Romola Garai's movies and her mannerisms are closer to Liara's, IMO.